Star Wars might be in a galaxy far, far away, but it also takes place a long time ago. You know what else was a long time ago? The Middle Ages. It's one of the reasons this artistic pairing is a perfect fit. 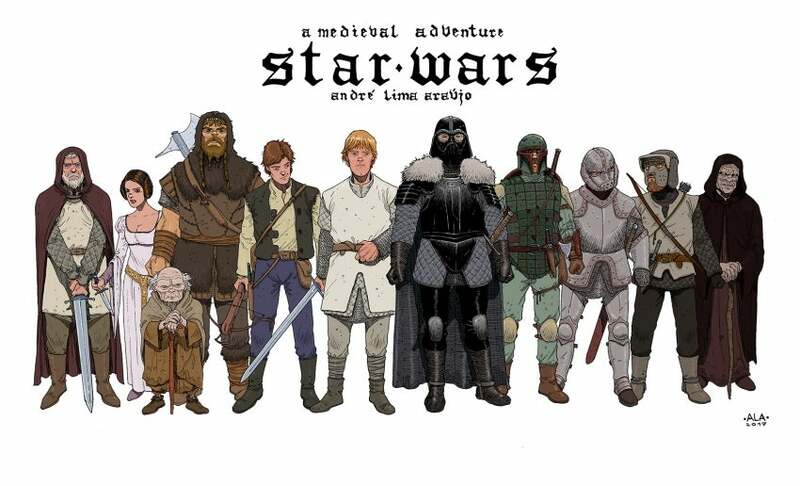 Artist André Araújo recently released a coloured print called "Star Wars Medieval," which takes some of the most famous characters from the original series and reimagines them as figures from the Medieval period. Araújo, known for his work on Marvel Comics, told me he created the piece after reading a book on Portuguese history. He said it made sense to twist Star Wars and medieval history together, given the common themes between them. "Star Wars itself is a very classic type of story — about family, love, war, good vs. evil — so it basically fits in any period. But in specific the large armies, the existence of swords, knights and princesses, for example, are direct links to medieval folklore," Araújo said. All of the characters look great, evoking Araújo's signature style, but Chewbacca was definitely my favourite character interpretation, having been changed from an intergalactic Wookie into a brutish, hairy warrior. Araújo said Chewy was the hardest one to reinterpret, but he thought it'd work if he made the character "a bit more like in the Germanic tribes from the early Middle Ages." Though I admit, I am curious what C-3PO and R2-D2 would look like in this style. "Star Wars Medieval" is available for purchase on Araújo's website. He's also getting ready for the release of his latest graphic novel, Generation Gone, written with Ales Kot. That comes out July 19.